The country has been bracing for this Super Typhoon Yolanda for days. At first, it seemed like we had triumphed over her, but as we gain access to the worst hit areas, we are learning just how much devastation she left behind in the Philippines. As of latest official count, there are about 134 casualties. After what we’ve seen in the footages, and what we’ve heard from journalists and people on the ground, that seems like a very conservative count. The poor communication lines, and island-wide power outage, are probably keeping the officials from confirming the numbers. But no matter how many, or how few lives were lost, it is still one or a hundred too many. Dr. Mahar Lagmay of Project NOAH (Nationwide Operational Assessment of Hazards) was interviewed on ANC today, and it was mentioned how the government has actually allocated money for advanced equipment to forecast weather conditions. He said too that the PAG-ASA and NDRRMC actually released an accurate model showing the path of Super Typhoon Yolanda. They were able to predict where it will hit landfall and identify the areas that will be most hit. The warnings were given, and resources were mobilized. It is sad though that some people still chose to stay in low-lying areas, and sadder still that identified evacuation areas were also submerged when the sea came rushing inland. Storm surges are not new. We’ve heard it mentioned before. But it looks like no layman actually understood what it meant, until now. Atom Araullo’s coverage in the morning of November 8 has been played over and over. One minute he was out on the road showing everyone how strong the winds were, and how rain was falling in every direction. Next thing the viewers knew, he had gone up the building where his crew was to take shelter, and the water had come rushing into the city. The people were ready for the strongest typhoon in the sense that they left their homes and sought shelter in identified evacuation centers. Multi-purpose halls, gyms, and schools, were the usual areas. But it wasn’t just the wind and debris they needed shelter from, water brought in by the storm surges proved to be the biggest concern. Dr. Lagmay said that storm surges were nothing new, and the warnings indicated the high probability of having them. So why weren’t appropriate evacuation centers identified? Why have the people relocate from the shoreline to one-story structures inland? Perhaps, it was really a lack of understanding of what exactly storm surges are. Now we know. Next time, we’ll know better. Here’s hoping that the spirit of bayanihan once again prevails and sees us through this ordeal as one united people. Here’s praying that when we rebuild, we rebuild with the lessons of this experience well considered. Here’s to wishing that when we look back to remember YolandaPH, it is resilience and pakikipagkapwa that we see, and not the looting of Gaisano. Gawad Kalinga also set up a page. A lot of Filipinos are not aware of what storm surge is until Yolanda came in. Honestly, I am not aware of it too but it was repeatedly being mention in the news. 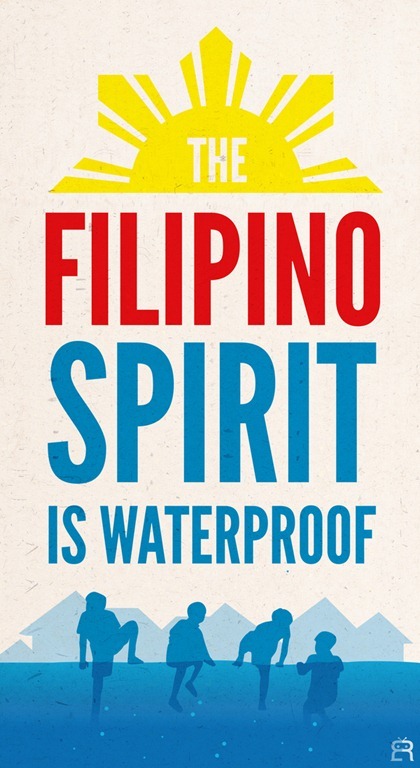 Anyway, I agree with you that Filipino is waterproof and no super typhoon can break our spirit. my heart is saddened because of this horrific phenomenon. and after many days, the relief continues to pour pero sana to the right people. Moving forward, I think PAGASA should make their advisories simpler in such a way that people can understand. Some of these weather terms can really be so abstract! With each calamity, new vocabulary is being introducted: lahar, storm surge, habagat. Everyone is trying to help. Ang problema, ang bagal ng pagdating ng tulong sa kanila! Marie´s last [post] ..Toothpaste That Cures Your Zits and Other Home Remedies! storm surge is now added in the dictionary of common people. I think, if this was only explained fully to the public, there will be less casualties after the storm. God Bless the Filipino people and those who are lending their hands to build up those cities. Jhari´s last [post] ..Paris Who? Whatever they call it, pag sinabing 5 meters and up ang possible waves, you don’t just brace yourself, expecting to be rooted where you stand. Mas maige that people should expect the worst rather than be caught unprepared. I say that next time, there should be a forced evacuation of ALL.